Every mom knows that a good rocking chair is essential for breastfeeding. But how to find one that is chic, eco-friendly, and won’t break the bank? And as I stare down the barrel of impending motherhood, I am quickly trying to get all my breastfeeding accoutrements together – and for the longest time the rocking chair was the most elusive item on my list. There is a surprising dearth of nicely-designed rocking chairs out there – most seem either to be 80s style leather ‘gliders’ that cost and arm and a leg, or old-school granny wooden rockers that don’t look too comfy for your derriere. 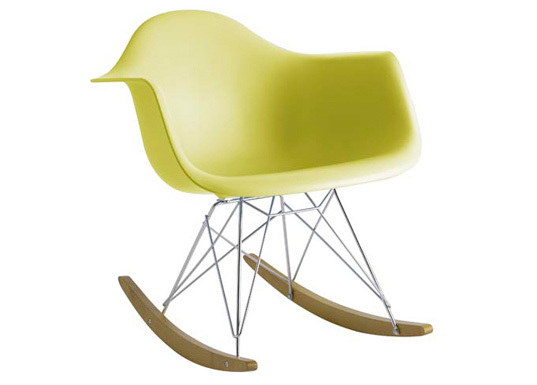 So you can imagine my delight when I rediscovered the Eames’ classic chair in rocker form! I’ve been a huge fan of Charles and Ray Eames for ages (what design fan isn’t? ), but upon first consideration I thought that maybe the plastic RAR rocker would be a bit too cold and uncomfy for late-night feedings. But then as I started to contemplate the not-too-pretty details of baby spit-up, messy toddlers and other cleaning/staining issues, the easy-to-clean plastic chair started to look more and more appealing, and now I’m totally sold. From an environmental standpoint, the Eames RAR Rocker takes the cake with it durable, long-lasting, simple and easy-to-clean form. This chair might be composed of steel and plastic (as opposed to the wood and polyurethane foam of most rocking chairs) – but if you thought a wood & upholstery rocking chair would be the eco-friendly choice, you would be wrong. Most polyurethane foam in cushions is nasty, off-gassing stuff, and likewise most wood that you can find in furniture these days is MDF/plywood/particle board complete with formaldehyde and other yucky VOCs. In terms of off-gassing, indoor air quality, and your family’s health, the steel and fiberglass composition of the classic Eames Rocker is definitely a safe choice. Also, as a collectible design classic which will last forever, you can be certain that this chair isn’t headed for landfill. Even if for some reason you need to get rid of it someday, you won’t have a problem finding someone willing to give it a good home. 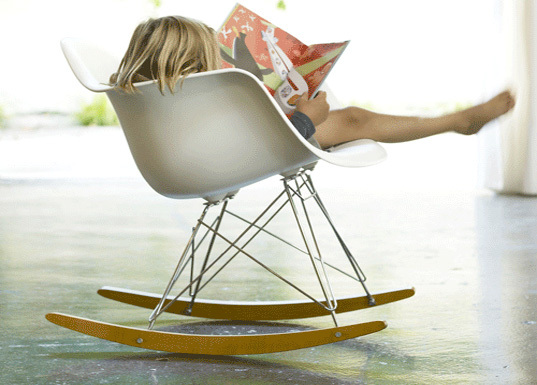 The original Eames RAR Rocker was made from fiberglass and steel. Today you can find the official ‘Eames’ brand chair produced by Herman Miller with a recycled polypropylene shell for about $450. You can also find unofficial knockoffs made out of the same original fiberglass material, for significantly less than the polypropylene shells. Word on the street is that the fiberglass is actually the more durable and eco-friendly material – and much less expensive – so unless you feel guilty about the trademark issue, fiberglass is probably your best bet. 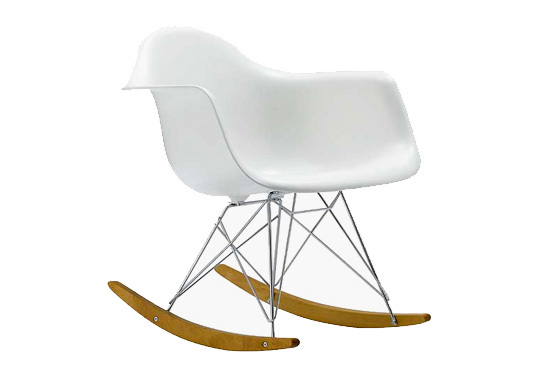 I found my white fiberglass Eames rocker on Ebay for less than $200. I hear you! There are very few rockers that don't look like they are straight out of design hell. Are there really THAT many people looking for gliders with oak sides? I also purchased the Eames rocker for my daughter's nursery, but I will point out that experience proved this to be a less-than-ideal option. It looks great, for sure. But the back on the rocker sits lower than my brastrap, which means that there is no leaning back or reclining to be had with this chair. And during middle-of-the-night feedings, I was often so desperate to lay my head back that I ended up on the couch in the living room instead of in the rocker. It's a comfy option for a few minutes, but much more than that and the plastic and low back get old, quick. I finally put the rocker in the living room and got a cheap (but high-backed) chair from IKEA. But the rocker is perfect for my toddler in the living - it is small scale and she loves to climb into it and read books, and I love that I can just wipe it down to clean. Anyways, love your new blog. I LOVE THIS CHAIR!!! I am about to start planning motherhood all over again after 14 yrs and two kids later! We are all about eco friendly!!! We have a business called seed sucker and it too sells organic apparel plus spreads environmental awareness! Check out the baby onesie! It will go perfect with this chair!!! Love the design! Hey, that is what I was rocked on by my modernist mom; it worked perhaps too well as I ended up in architecture. I also found the rocker beautiful but not comfortable for breast feeding, snuggling or reading with my kids. I ended up adding a sheep skin rug from Ikea which helped but didn't do much for the strong urge, as Mama Manifesto states, to rest my head. Great rocker. My daughter will surely love this. This rocker well looks durable and easy to maintain. Can be placed indoors or outdoors although might not be good if placed in an open garden. Sometimes simply design can turn out to be a great product. I think this is a great example. Every mom knows that a good rocking chair is essential for breastfeeding. But how to find one that is chic, eco-friendly, and won't break the bank? And as I stare down the barrel of impending motherhood, I am quickly trying to get all my breastfeeding accoutrements together - and for the longest time the rocking chair was the most elusive item on my list. There is a surprising dearth of nicely-designed rocking chairs out there - most seem either to be 80s style leather 'gliders' that cost and arm and a leg, or old-school granny wooden rockers that don't look too comfy for your derriere. So you can imagine my delight when I rediscovered the Eames' classic chair in rocker form!